After Hurricane Harvey in August 2017, one elderly Rockport, Texas, resident had two inches of standing water in her home, cracks in the ceiling, no running water, and a caved-in bathroom floor. But her first Federal Emergency Management Agency (FEMA) inspection deemed her house safe to inhabit and ineligible for aid. After a Legal Aid attorney helped her appeal FEMA’s decision, the household qualified for $27,000 in assistance. Each step of the disaster recovery process can have unnecessary complications, inconsistent regulations, and gaps through which the neediest and most underserved disaster victims can slip. And the first step in the process, disaster damage assessments, could result in incomplete and inaccurate assessments and overlooked properties. Last year’s slew of natural disasters emphasized concerns over potential problems in the production line of data collection, analysis, and data-driven decisionmaking. How can we improve disaster damage assessments to ensure affected households are properly counted and to ensure disaster victims receive the help they need? Who conducts disaster damage assessments, and why do they matter? Damaged properties are immediately inspected after a presidential major disaster declaration, followed by repeated inspections by private insurance, FEMA, the Small Business Administration, or the US Department of Housing and Urban Development’s (HUD’s) disaster recovery grantees. State and local authorities lead early damage assessments, but local governments are likely to request federal assistance when the magnitude of damage is significant and when federal collaboration of damage is necessary. Field teams composed of local, state, and federal entities (potentially along with nonprofit relief organizations such as the American Red Cross) conduct site visits beginning with the most severely damaged properties. A preliminary report is then issued by FEMA to the state or local government as that government decides whether to trigger larger FEMA assistance programs. For private housing, this is the Individual Assistance Program. FEMA inspections occur within two weeks after an Individual Assistance application has been submitted. These inspectors are usually local or regional contractors with varying backgrounds. Their inspections are crucial for aid funding because if Community Development Block Grant Disaster Recovery assistance is appropriated, HUD and its grantees rely on these damage assessments for determinations of aid and aid values. The number of assessments after severe disasters can be massive, with 895,435 applications for FEMA assistance in Texas from Hurricane Harvey, more than 1.1 million in Puerto Rico from Hurricane Maria, and more than 2.6 million in Florida from Hurricane Maria. And those were just 3 of the 20 disasters in 2017 that triggered FEMA’s Individual Assistance Program. What leads to inaccurate assessments, and how can they affect disaster victims? With that many assessments, problems are inevitable. Despite advances in technical methods and standardized processes, assessments are far from perfect. The first problem arises in getting the inspection. Some properties might be inaccessible to inspectors for reasons related or unrelated to the disaster. FEMA-contracted inspectors must attempt to contact the household at least three times. For those who have been forced to relocate from their prestorm home or who have no private transportation, meeting the inspector poses a challenge. Texas data show that inspectors often cannot reach these applicants, as 9.6 percent of homeowner applicant ineligibility is because of failing to make contact. For renters, that share climbs to 14.4 percent. Renters face additional challenges if their landlord has terminated their lease or has refused to allow them access to their unit. Applicants are told not to remove their damaged belongings from the property until the inspector can record them. But a renter has little control over their own home and might not be able to fulfill these requirements. Additional problems come from varying quality and consistency of the inspectors and their techniques, and these challenges are likely to lead to households in need being denied assistance. In another post-Harvey case, one resident was denied FEMA assistance even after the storm “poured down so much water that the house started to sink.” He lost his car and his carpentry tools in the storm, making him unable to work, and he was forced to move into a motel because of the damage. He said a FEMA inspector had told him there had been an existing problem with his home before the storm, making him ineligible for assistance. There were consistent complaints after Hurricane Harvey of inspectors taking only five minutes to inspect damage or not entering the home at all, according to the Texas Low-Income Housing Information Service. When the denial letters came, many households were so discouraged that they didn’t file an appeal. Attempts to speed up the process might jeopardize more than technical accuracy. They could also lead to a lack of consistency in assessing damage. For some communities, the assessments of older homes might unfairly attribute damage to preexisting conditions rather than the hazard in question. There also might be biases or fraud introduced in the technical damage assessment based on the property’s location and characteristics of the people who live there. How can we improve damage assessments? 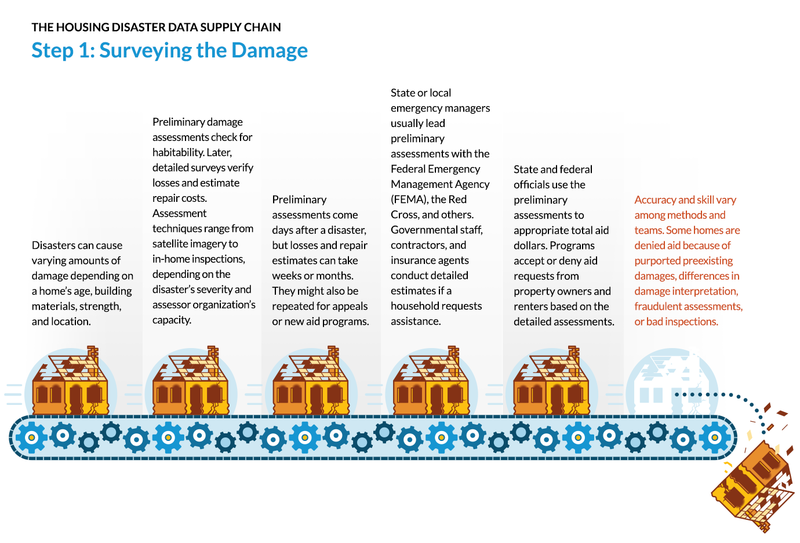 As the first of many data-collection activities after a disaster, the assessment of damages to a house establishes several fundamental recovery decisions, starting with determinations of eligibility for public and charitable assistance programs. Improving damage assessments through peer-reviewed testing of data-collection instruments, consistent and robust training of field assessors, and a comprehensive data-documentation system and quality-control protocol could lead to more accurate data and better results for households affected by disasters. FEMA’s recently released review of its 2017 activities acknowledges these data opportunities and acknowledges that agency and local governments weren’t properly prepared for last year’s disasters. As we see wildfires spread across California this year and the potential expiration of national flood insurance this week, we must continue to ask ourselves if we are prepared for the next disaster. From left to right) Bryan Parson, Chris Gaspard and Derek Pelt help remove ruined items from Parson's home following flooding in the wake of Hurricane Harvey on September 1, 2017 in Dickinson, Texas. Photo by Win McNamee/Getty Images.